Easter has come and gone, but my chickens didn’t get the memo. As is only natural for chickens, with the long days of springtime they are laying more…and more…and more eggs! So, what can you do with eggs? 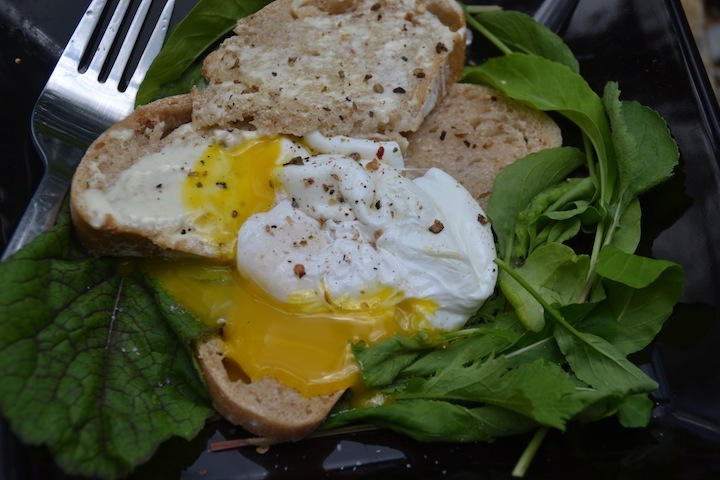 I grew up in a mostly non-egg-eating household, and only came around to using them in anything but baked goods a couple of years ago, after a friend introduced me to poached eggs. Soft boiled eggs were ok…fried eggs made my stomach turn at the mere thought…hard boiled, yuck! Pickled eggs and scotch eggs seemed a little over-the-top. The humble poached egg, however, was just right. Over the last few months I’ve often recommended to people that they try poaching the fresh, richly flavoured eggs that they purchase at the Nidulari farmstand. Poaching sets off the beautiful orange yolks and preserves the firm texture of the fresh white. 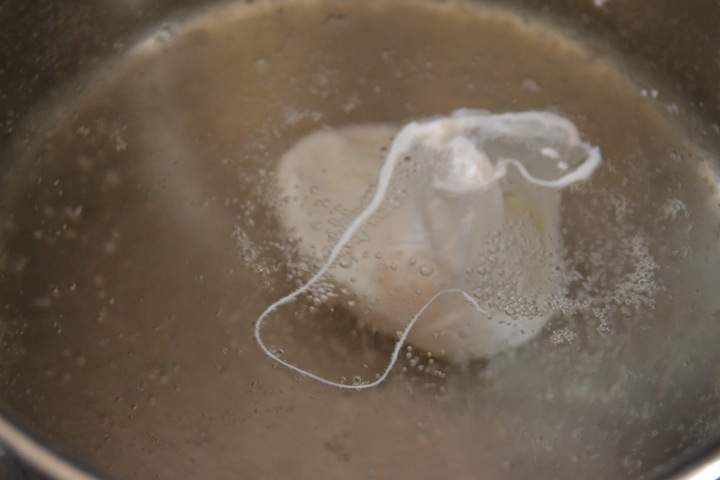 With no oil or contact with a pan, poaching preserves the full, unadulterated flavour of the egg, and allows the white to fully solidify while the yolk remains an evenly soft –even liquid– texture. I could go on all day, but I’ll spare you that. So it turns out that I’m not the only person to have missed out on poached eggs for so many years. Apparently in the modern kitchen poaching is somewhat of a mystery, a lost art form even. 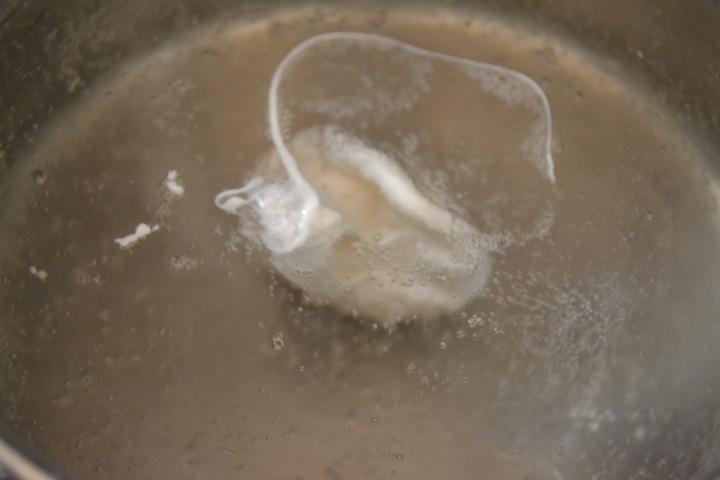 In fact, poaching an egg is a quick and simple matter, requiring nothing more than a deep pan of water, a pinch of salt, and a dash of vinegar (the latter is optional, but helps to control the spread). 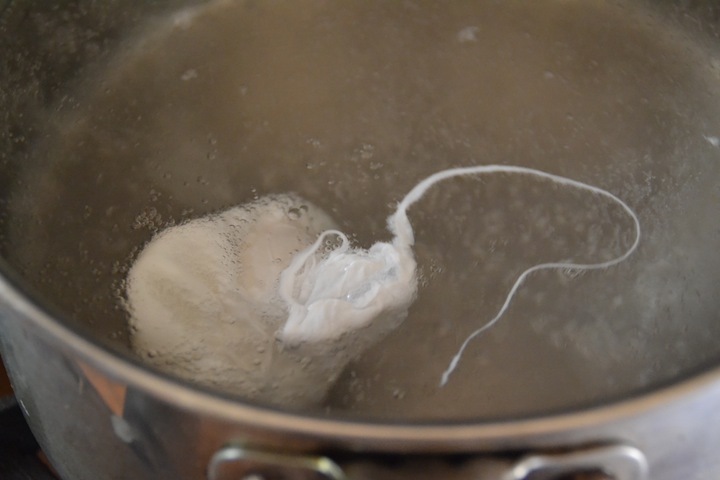 Just bring your pot of water to a good boil, add the salt and vinegar, give a quick stir with a spoon to create a small vortex in the center of the pan, and immediately break an egg into the vortex. If poaching multiple eggs, it’s best to skip the vortex and to carefully break the eggs in opposite sides of the pan. 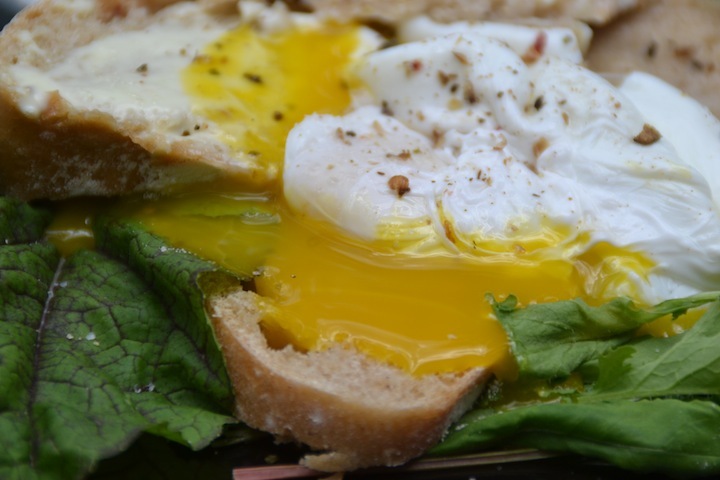 In 1-2 minutes your egg will be ready to gently fish out with a large slotted spoon to be eaten on toast, salad, anything! I prefer for the white to be somewhat solid, but the yolk to still be almost-completely liquid. There are some cheats to make poaching “easier” – poaching cups, poaching pans, etc – but I find that there’s nothing quite like a good fresh egg poached directly in water on the stove top, then served with coarsely ground black pepper and a sprinkle of salt. While we’re talking about eggs, are you still buying those jars of gross white stuff that they pass off as “Mayonnaise”? If so, why? By the way, the one (and only) advantage to that stuff is that it *does not need refrigeration*. I lived on a boat for over a dozen years with no refrigeration and never once had commercial mayo go bad, trust me there. So, unless you live without refrigeration, or in a place where eggs and oil are unavailable, there’s no need to buy that anymore. 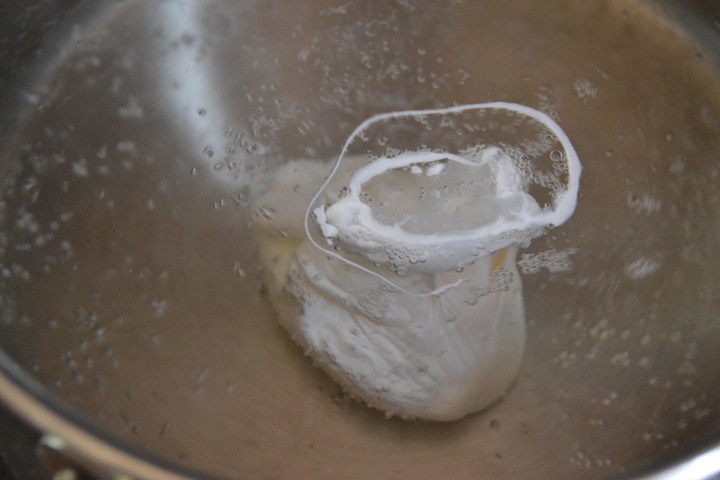 Making fresh, real, flavourful, relatively-healthy mayo takes under 1 minute and only 5 ingredients. I like to make it with a little mustard or garlic added, to toss in pasta salad, eat with poached eggs, or just moisten a sandwich. I’ve left it out on the counter all day, in packed lunches, and kept it in the fridge for 2+ weeks…never been sick from it yet! 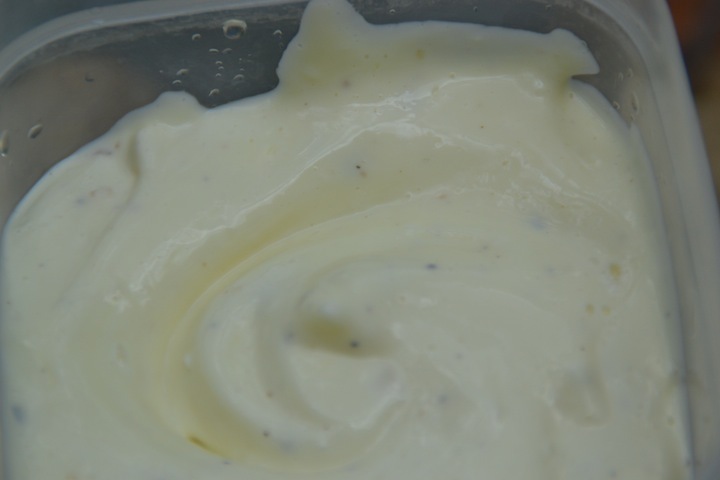 To make a really great dip, mix 1/2 a cup or so of fresh mayonnaise with a few tablespoons of Nidulari Banana Ketchup or any of our Chutneys. Put everything except the oil into a bowl, blender, or food processor. If using a bowl, use an immersion blender. Beat the mixture thoroughly, then, still beating, slowly (really slowly!) drizzle in the oil. It should start to thicken by the time 1/4 of the oil is in. If adding mustard or garlic, add halfway through the oil. The whole process should take under a minute – once all the oil is added taste to see if it needs more acid or salt. If it’s too thick, then you can add a drop of hot water and beat a little more. Too thin….start over! 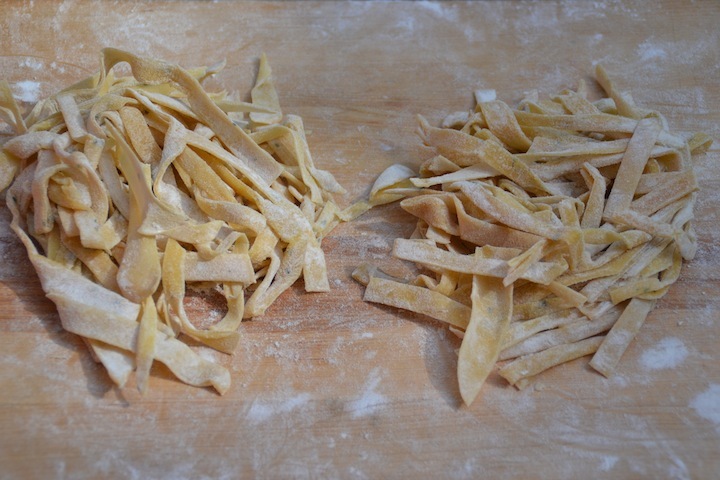 I’m still perfecting a recipe for fresh pasta before making larger batches for sale…last week I made a tasty fettuccine with rosemary and thyme. I hope to have inspired you to try something new with our wonderful fresh eggs – or your own fresh eggs if you keep hens. I do love keeping chickens, for they provide a peaceful background chatter, not to mention keeping the compost pile in such good order! Don’t forget that you can buy eggs from our Wednesday farmstand on Mahogany Road from 2:30-6:30pm, and you can order them through Prime Produce market for C’sted delivery, or from Cruzan Gardens on Midland Road – all the same places that you can get Nidulari wood-fired bread. A brief reminder that there will be no baking on May 6th, as I’ll off being irresponsible in Puerto Rico for the week. So stock up your freezer this week, and then I’ll see you again on May 13th! Cheers! try a quiche. I love to make crustless quiches and add just about anything to them.I have recipes if you want. Thanks, Anita! I do make quiches fairly frequently – with garden greens, herbs, potato, anything I have that needs using! One of my favourite ones is where I use a layer of thinly sliced potato where the crust would be, then add the filling as usual.